First thing’s first – I work for Skyscanner so yes this is a little biased BUT, if you think about it, that has some serious perks because I know how this thing *actually* works. Now that we’ve got that bit out of the way, these are some of the best ways to use Skyscanner to save cash money on those pesky airfares. Mainly because it’s probably wrong. Before I started working here I too thought that those pesky cookies actually made a difference, but it’s a total myth that’s plagued the Internet – Brownies’ honour. 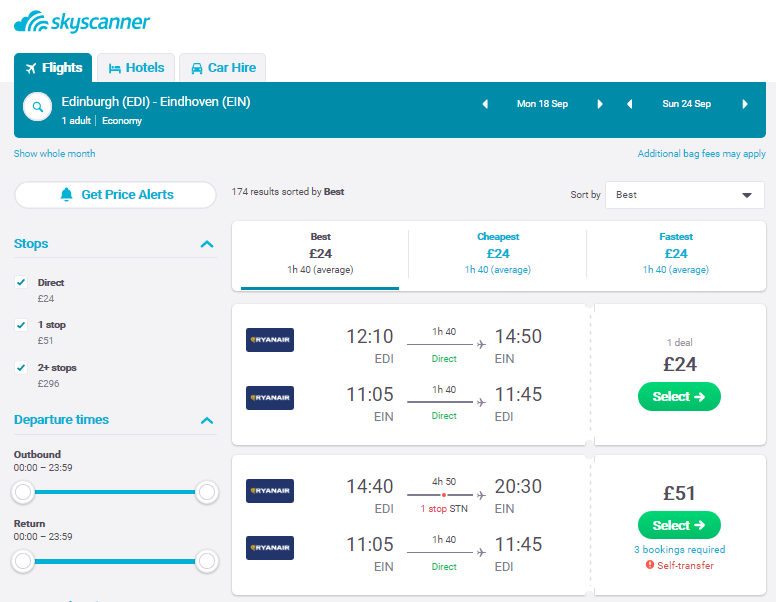 Skyscanner is completely unbiased, relies on prices being passed over by travel agents or airlines and has absolutely no control over the prices. Ziltch. Nada. Zero. But Jeeeeennn. Why have the prices changed then? They change in real time. They try insanely hard to keep the prices accurate but if the provider decides they have loads of seats left and want to gather back some of the costs that they might lose, they might choose to increase the ticket costs. It’s completely down to them. You can read more about it here. No idea where to go? Fancy just searching for places at random? Not a fan of planning in general? The Everywhere search is literally a game changer. Pick your starting airport or country, select ‘everywhere’ in the ‘to’ box, hit that giant green button and let all the options flood in. Flexible on dates? Click the date boxes and pick your poison. Got a diary which is free as a bird? Then you’ll probably want to hit ‘Find Cheapest Month’ for ultimate savings – it’s a bit like playing roulette but with fun adventures as a reward. All prices in this view are estimated lowest prices. These are NOT live. So how does it work? I’m glad you asked because that’s a very good question. It works by storing up prices it finds from other users who’ve searched for that exact same route and then provides an estimated price in the calendar or bar chart view. Use it as a guide to see when’s cheap, pick your dates, hit that big ol’ ‘Show Flights’ button and the search engine will re-run your search and come back with prices from the providers. £24 still not quite right for you? 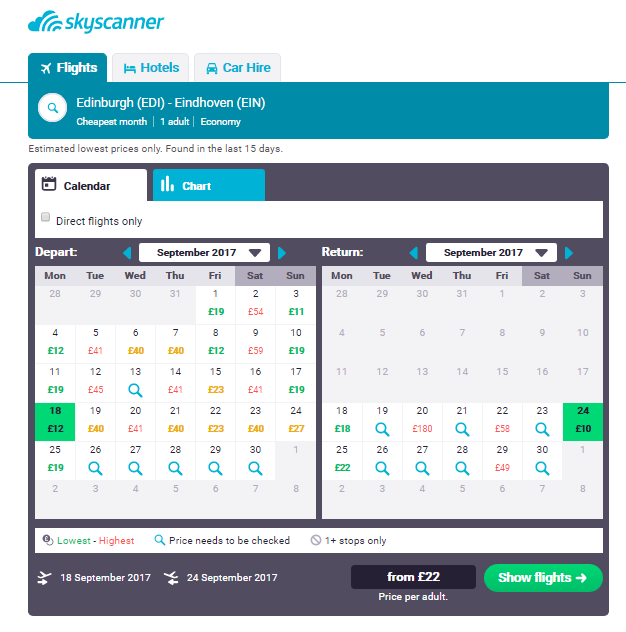 Set up price alerts on the website or download the Skyscanner app and get push notifications if the price changes. Don’t get too excited if you get a wee alert though – these get sent out if the price goes down or up. You get to swan past everyone waiting in those giant queues to send their luggage away on the conveyor belt of the unknown. And look damn smug about it too. You don’t need to wait at the carousel of misery for your bag that may or may not turn up. You ditch the ‘is-my-bag-less-than-15kgs’ fear at the scales. It’s a horrible game that might end up costing you a whack more if you’ve got wild with the packing. You keep your stuff close at all times. If you’re travelling on budget airlines, luggage costs will not be shown in the price on Skyscanner. It’s considered an added extra and is it really worth it for a £24 flight…? I know I’m all about humans, but this is the one time when bots are pretty handy and I’m not talking about the inspirational stuff you can find in the Messenger Bot. Oh no, no, no. I’m talking about data that can be used to your advantage. Think of the power. Before I get too ahead of myself, it’s time for a disclaimer: these are average prices based on years and years of flight data. It should only be used as a guide and not seen as the holy grail of super secret insider flight tips. Once you type in your destination and departure city, hit the ‘more route tips’ option and bask in the info that’s presented to you. Use it wisely! So there you have it. 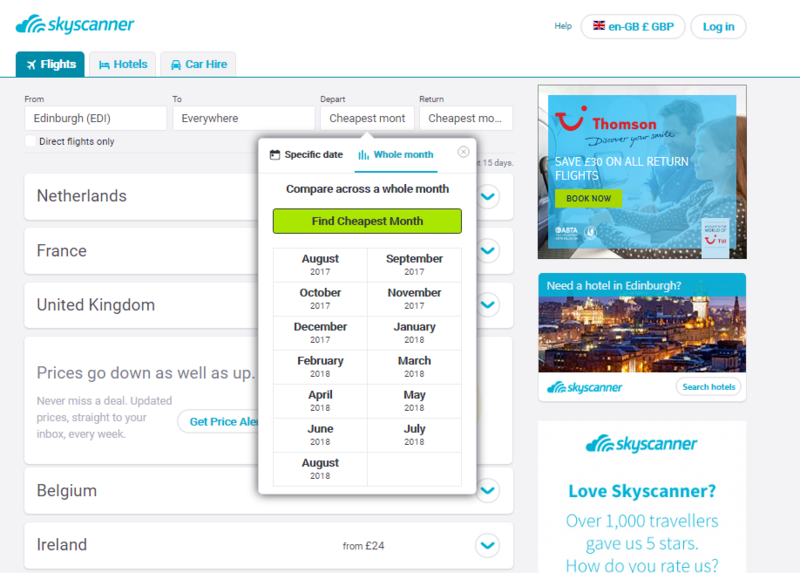 A few super simple ways to use Skyscanner to save you money. Have I missed anything? Want to know more? 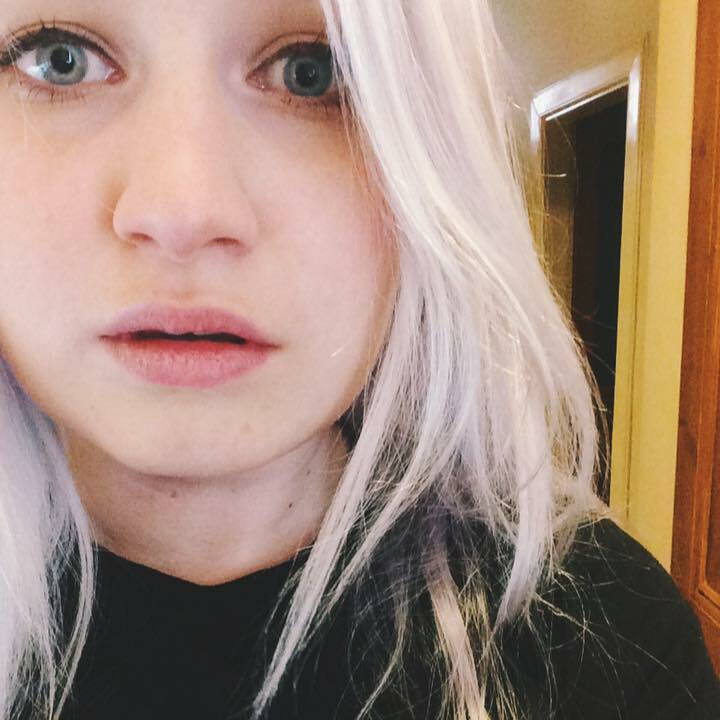 Yell at me in the comments or via Twitter.